Medical mats can serve many functions in your healthcare facility. They can promote your brand with colorful and visual messages, prevent dirt, moisture and bacteria from spreading throughout your building and provide cushioning for workers that are required to stand for long periods of time. Your employees will be happier, your business will be cleaner and you’ll get your brand message across in a new and interesting way! To get medical mats that are appealing and functional, work with Medico Professional Linen Service. Whether you’re looking for medical mats to match your facility’s logo or you’re stocking up on new mats for your surgery rooms, laboratories and wards, Medico has the right one for you. We have a wide range of medical-grade floor mats that work well in a variety of healthcare facilities. 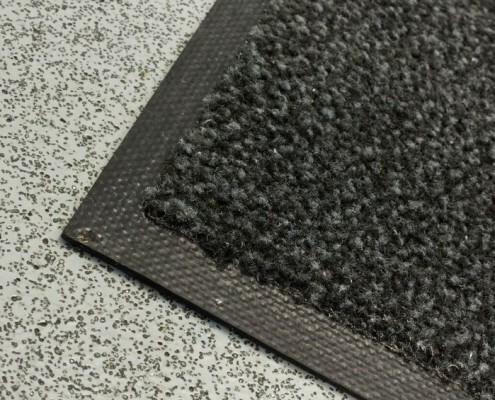 We match our matting products with on-time cleaning and replacement services, all done in compliance with industry standards to keep you, your patients and your employees covered. We’ll keep your emergency rooms clean, your operating rooms skid-free, and your entrances dust-free. You are not only assured that your mats will do what they’re supposed to do – you can rest easy knowing that your mats are treated and processed with as much importance as other hospital linens. Whether we’re cleaning and maintaining scrubs, sheets or scraper mats, we try our best to provide flawless services and products. With our professional mat services, you’ll never have to worry about being caught off-guard with dirty or worn-out medical mats. You never have to worry about low-quality mats that get worn out too soon. Medico Professional Linen Service has everything you’d need and want in your medical floor mats! Get in touch with us today for a free medical mat services consultation. Our floor safety experts will help you find the right matting option for your healthcare business.